Get the best of both worlds by living ultra-luxuriously at this private estate on an incredible game reserve in Southern Africa. 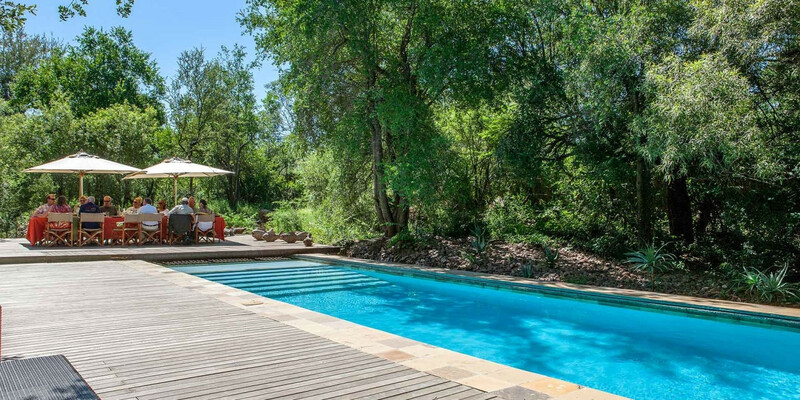 A sleepy, yet epic, retreat beneath the canopy of an ancient Morukuru Tree on the Marico River, this chic getaway comes with a home office, wine cellar, library, and infinity pool. 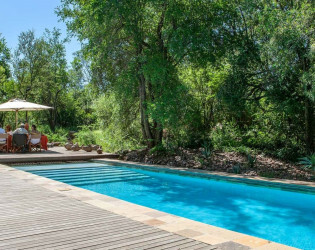 Tucked under the leafy canopy of an ancient Morukuru tree (Tamboti Tree), on the banks of the Marico River, lies this perfectly decadent, ultra luxurious home away from home. Ideal for honeymooners, couples or a small family, Owners House was built by the owners as their own private retreat, with two huge en-suite bedrooms and a choice of shared spaces. Nestled in between the Morukuru Trees, surrounded by decks and balconies, Owner’s House offers plenty of peaceful nooks to hide off alone, or to gather for wonderful al fresco meals. Whether reclining together by your infinity pool, or alone in your private elevated sala, or just lying in bed with the doors wide open, the combination of dappled shade, and the sound of nature is deeply restorative. The Owner’s House also combines contemporary European styling with handpicked African pieces, and every luxury – including a team of 8 staff at your service, home office facilities, a superb wine cellar for your perusal, wifi connection, stereo system, dvds, cds, a small library stocked with topical books and the opportunity to bathe outside under the stars. Wood, stone and glass provide seamless design flow between in- and outdoors. Morukuru Owner's House offers 2 bedrooms en-suite and can only be booked on exclusive use basis, including all meals, drinks and activities. Also included are an open private safari vehicle, private guide, tracker, chef, butler and general housekeeping staff. Morukuru Owner's House offers 2 bedrooms en-suite. Nestled in between the Morukuru Trees, surrounded by decks and balconies, Owner’s House offers plenty of peaceful nooks to hide off alone, or to gather for wonderful al fresco meals. Whether reclining together by your infinity pool, or alone in your private elevated sala, or just lying in bed with the doors wide open, the combination of dappled shade, and the sound of nature is deeply restorative.